There are several departures daily by ferry from Bluff (1 hour) www.stewartislandexperience.co.nz, or small plane from Invercargill (15 minutes) www.stewartislandflights.com, as well as customized Helicopter charters. There are great Air New Zealand connections throughout the country – you can fly down from Auckland, or eg Napier, leaving in the morning and be at Stewart Island for lunch! From Australia there are great connections to Queenstown or Dunedin which bring you within hours to Southland and Stewart Island. Leave the car behind – and then …. Slow down and go for “island time”. Take your time – many guests found Stewart Island the highlight of their New Zealand travels, offering the best of all experiences in one place, and wished to have more days available. We can advise and organise activities – you will be five min walk away from Golden Bay wharf / departure point to Ulva Island Nature Reserve & Open Bird sanctuary (we can arrange water taxi transport for you). To the village centre it is a stroll of 8 min. You will find a general store as well as a lovely museum, craft shops and the Department of Conservation Visitor Centre. There is a limited number of Cafes or Restaurants. A very special opportunity is Greenstone Carving – There is a master carver on the island, and with a one day workshop you even could make your own piece of Jade / New Zealand Greenstone. You can hire Electrical bikes – easy and fun to get around with. IF you are lucky to have an AURORA AUSTRALIS (southern lights) to occur, the Lodge with the bedrooms, decks and lounge facing southwest, would be THE place to watch it. We are following up Aurora Forecasts, as we are very keen to see them ourselves, and are happy to keep you updated once here. Also, we are the perfect place to watch the stars and milky way – Southern Cross is raising above Observation Rock. No light pollution at our side of the village. Stewart Island´s Dark Sky Reserve! Guided Tours are offered by different operators. Stewart Island is a walker´s paradise, offering stunning coastal, bush and forest walks from 10 min to half or full day activities, for all fitness and ability levels. Our favourites right at the door step are Fuchsia Walk (a perfect 10 min alternative to get to the village centre), Raroa Walk (huge native trees in a never milled forest), Golden Bay-Deep Bay-Ringaringa Walk (forest, coastline and beach – all together). Clothing and footwear for “all seasons” is advisable, also bring a torch if you might go out at night time. 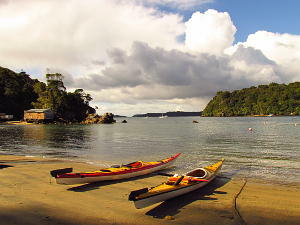 Sea Kayaking at Stewart Island offers the whole range from exploration for the beginners in the pristine clear bays of Paterson Inlet, to advanced Sea Kayaking expeditions – ask us about options. 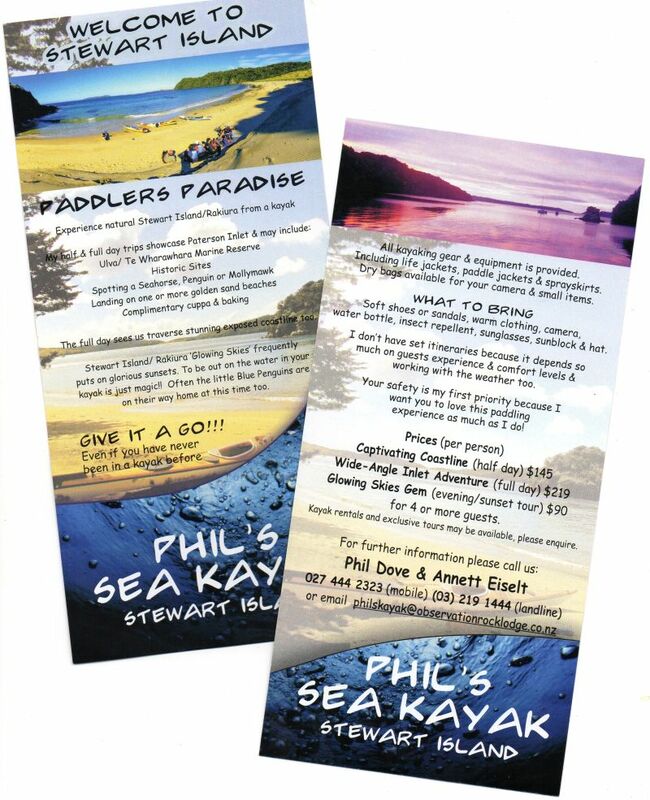 Phil is an experienced and certified kayak guide – if you are interested he can offer tours (weather dependent) – a beautiful, quiet way to explore the coastline and golden sandy beaches, sea birds (eg albatrosses and penguins!) 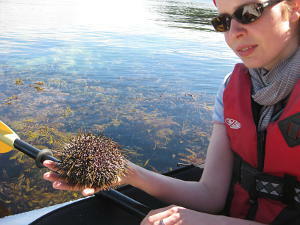 and other animals and the impressive intertidal under water life. We are lucky to have an awesome Marine Reserve right on our doorstep. 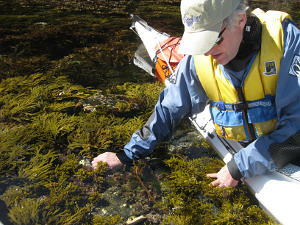 Crystal clear waters, starfish, seaweeds and kelp like an underwater forest – often we see even seahorses!